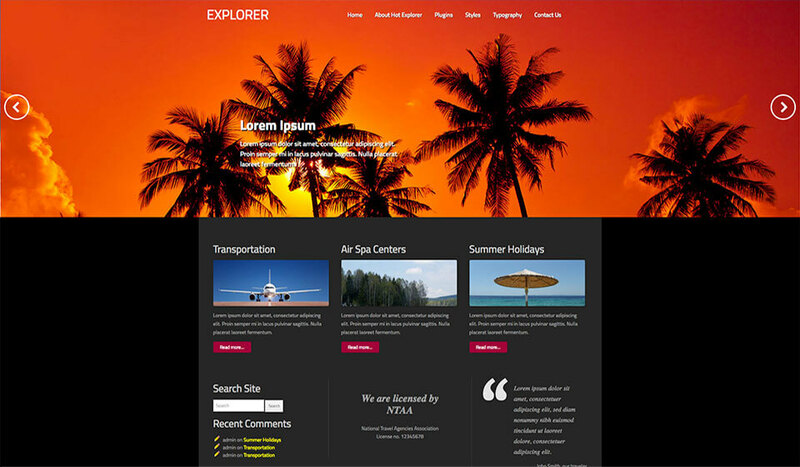 Hot Explorer theme is a good choice for development of websites for travel agency, hotels, or touristic destinations. 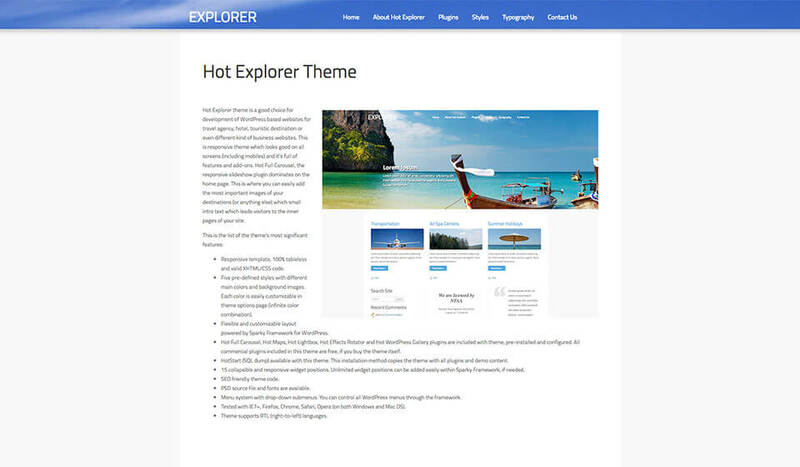 Travel WordPress theme Hot Explorer is a responsive theme which looks good on all screens (including mobiles). Beside that, it’s full of features and add-ons. 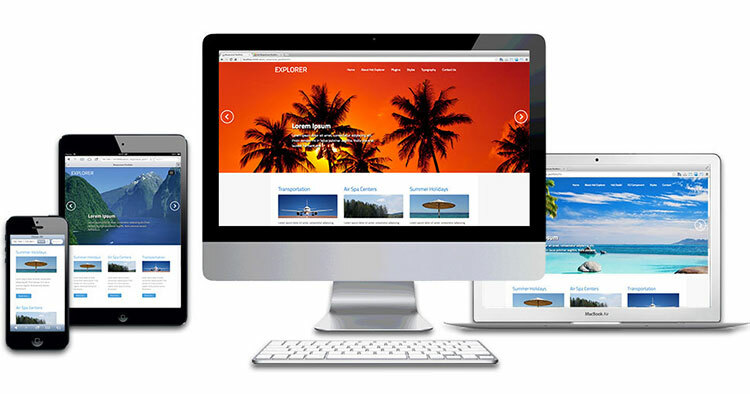 Hot Full Carousel, the responsive slideshow plugin, dominates on the home page. This is where you can easily add the most important images of your destinations (or anything else). The small intro text leads your visitors to the inner pages of the site. 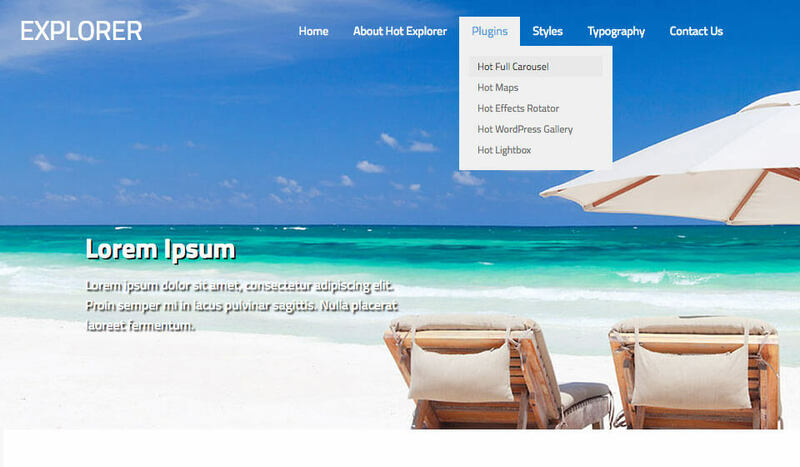 This is another theme by HotThemes which is based on the Sparky Framework for WordPress. You can download this framework for free to test it. 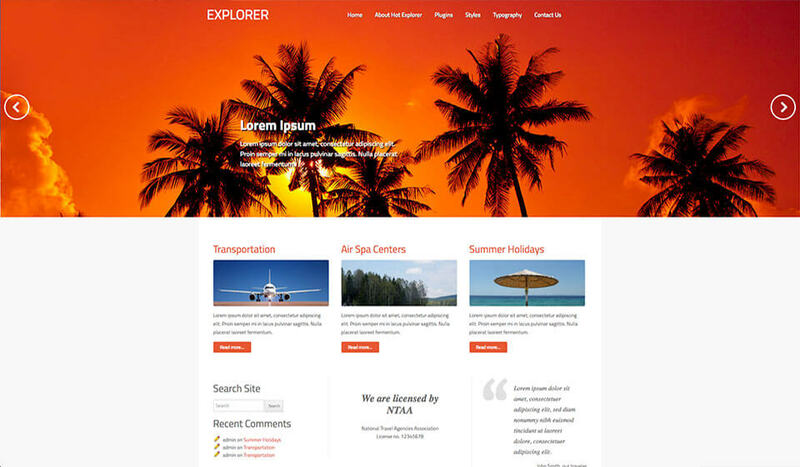 In short, all sites based on this framework, including the travel WordPress theme, are responsive and have full flexibility. 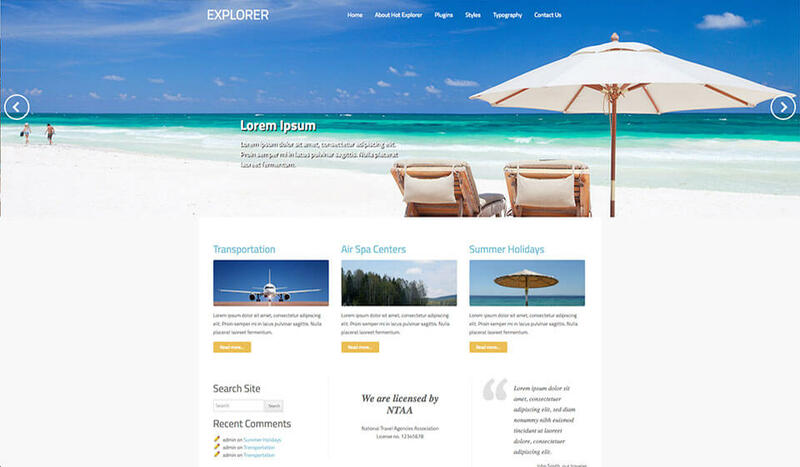 It allows you to move the travel WordPress theme’s elements here and there through the drag and drop interface. Through the framework, you can also control all site colors, fonts, menus and other site elements quick and easily. 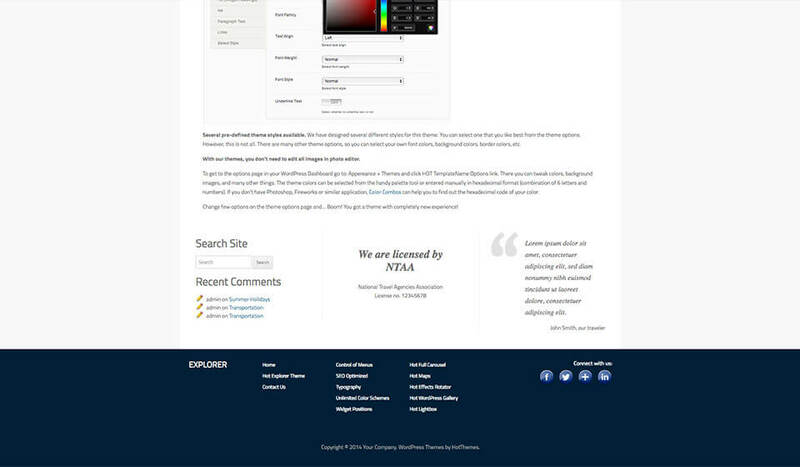 You have full control of the site appearance from the theme options page. 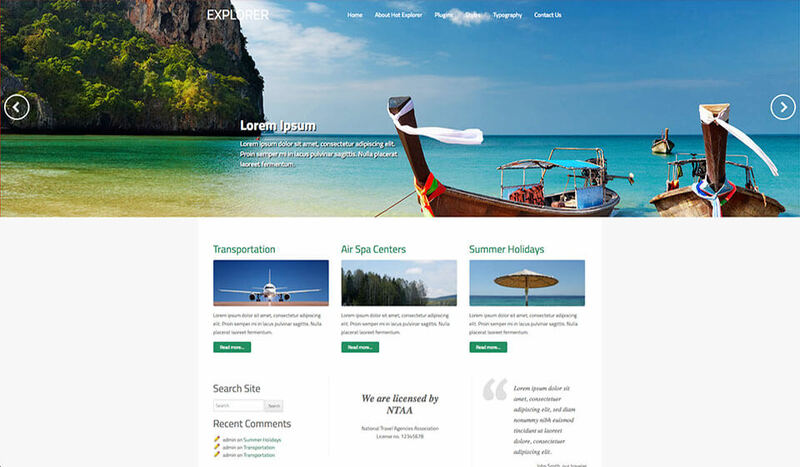 Travel WordPress theme is based on a responsive-friendly design. It’s clean and functional. The theme is based on a valid HTML/CSS code. There are 5 pre-defined styles with different main colors and background images. Each color is parametrized and easily customizable in theme options page. Therefore, with this theme you can make unlimited color combination. 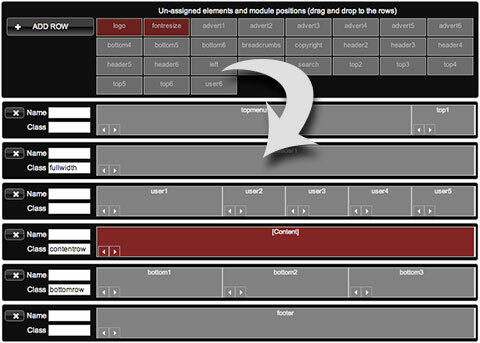 Finally, there are 15 collapsible and responsive widget positions where you can place various widgets. Even more widget positions can be added easily within the Sparky Framework whenever it’s needed. Hot Blankie is a responsive WordPress theme. This means it will look good and optimized on all desktop and notebook computers, as well as mobile devices (tablets and smartphones)!